These Pfeffernusse (German spice cookies) are small spice cookies that are sweetened with molasses and brown sugar. 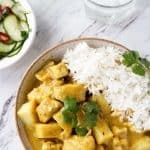 Our version has an extra spicy kick from black pepper and unique flavor from anise and cardamom. 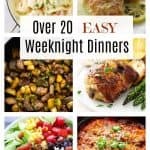 You are going to love these cookies! These delicious spicy cookies are called Pfeffernusse or German spice cookies. Pfeffernusse are German spice cookies that originally evolved from gingerbread. 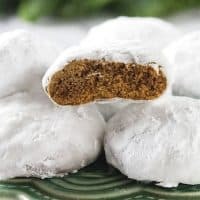 They have a different spice mix than gingerbread and are shaped into round balls and covered in a thick sugar coating. Yes, you read that correctly. There is pepper in this cookie recipe. Most recipes for pfeffernusse call for pepper, white pepper to be precise. The pepper adds a subtle but unique zest and is really worth adding to the batter. We don’t typically have white pepper laying around and have not found a difference in flavor after substituting regular black pepper. Feel free to use white pepper if you want a more authentic pfeffernusse cookie. 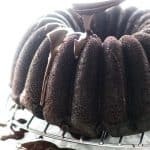 This recipe also has an anise flavor and a delightfully sweet sugar glaze. 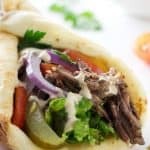 Initially, after baking them they will be a bit hard and make great dipping cookies, however, they are even better if they are eaten a few days later when they soften up and their flavors deepen. 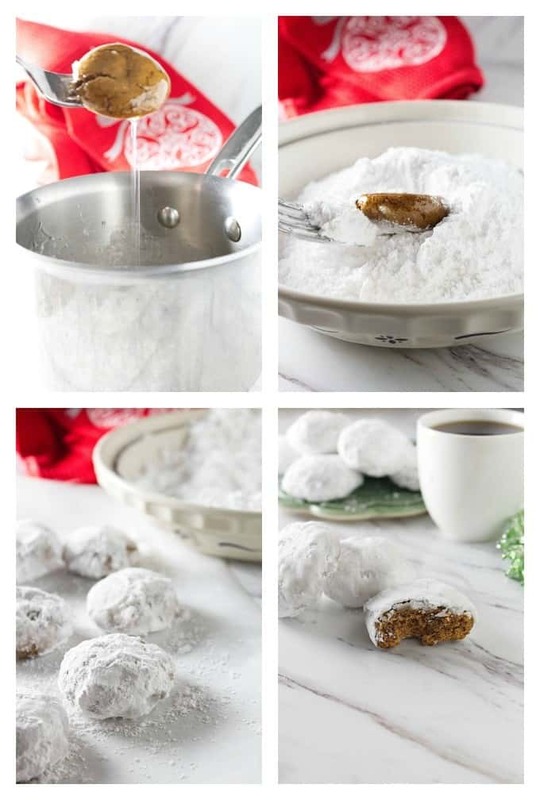 Dipping cookies in sugar syrup then coating them with powdered sugar makes a thick sugar coating. There is a thick snow-white sugar coating on these spicy cookies. The sugar coating is a must and turns the cookies into little round snowballs. 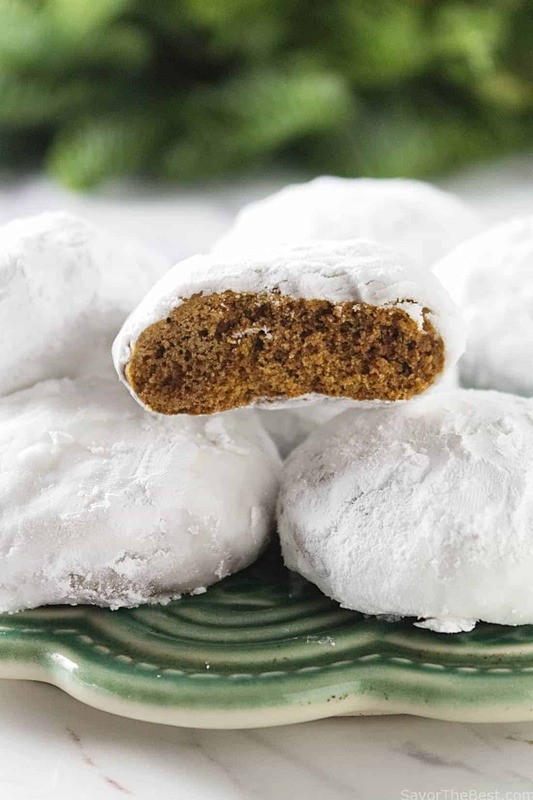 To make the coating, we dipped the cookies in an anise-flavored sugar syrup then rolled them in powdered sugar. After the powdered sugar sits for a while, it absorbs the wet sugar syrup and looks a bit goopy. That is exactly what you want it to do! A second dip in the powdered sugar gives it a completed look and a thick sugar coat. 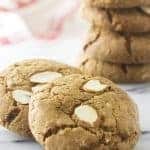 An easy recipe for Pfeffernusse (German Spice Cookies) that are sweetened with brown sugar and molasses and a nice balance of spices plus a bonus of anise. In a large mixing bowl, beat the butter and brown sugar on medium high speed until smooth. Beat in the egg and molasses until well blended. Dissolve the baking soda in the hot water then add it to the mixture and beat well. In a medium bowl, combine the flour, salt, anise seeds, cloves, black pepper, cardamom, and nutmeg. Add the flour mixture to the batter and mix on low until the dry ingredients are moistened then mix on medium speed for 1 to 2 minutes. Make certain to scrape the bottom of the bowl to incorporate the ingredients thoroughly. The dough will be very thick and stiff (see notes). Wrap the dough in plastic wrap and refrigerate the dough for 6 hours or overnight. Preheat the oven to 350°. Scoop large rounded tablespoons of dough then roll them into balls. 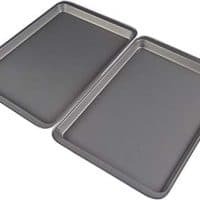 Place them on a greased cookie sheet 1 to 2 inches apart. Bake for 12 to 14 minutes until puffed and cracked. Allow cookies to cool completely for 1 to 2 hours. While the cookies are baking, make the sugar coating. 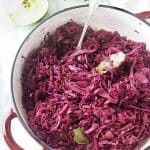 In a medium saucepan combine the granulated sugar, water, and crushed anise seeds. Bring to a boil while stirring until the sugar is dissolved. Turn off the heat and allow to cool completely. Place the powdered sugar in a separate dish such as a pie plate. Dip the cooled cookies into the syrup and scoop them out with a fork, allowing the excess syrup to drip off then roll them in the powdered sugar. 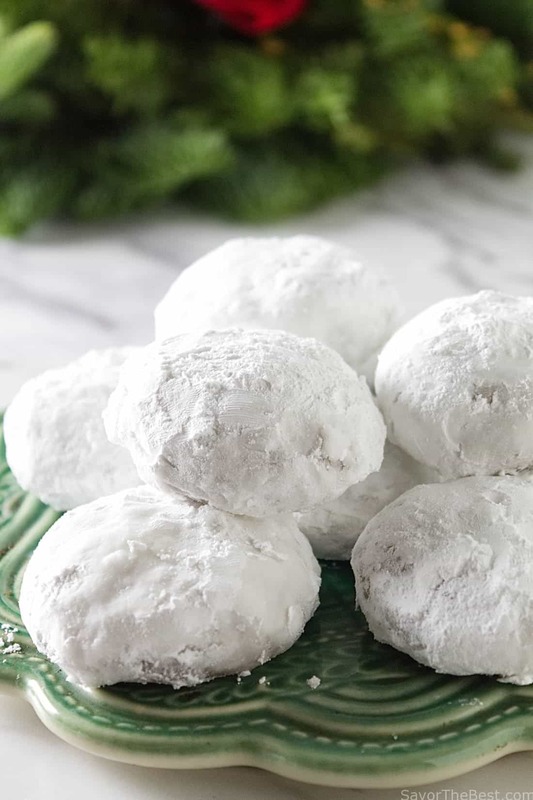 Set them aside on a sheet of wax paper for 10 to 15 minutes while the powdered sugar soaks in, then dip them one more time into the powdered sugar to give them a final white coating. The dough will be very thick and stiff (see notes). Some electric mixers might not be strong enough to mix the dough, if yours is working too hard dump the dough onto a counter and kneed by hand. 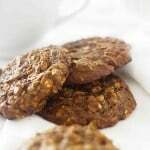 These are the perfect cookies to make ahead of time as they store well in an airtight container for up to 4 weeks. 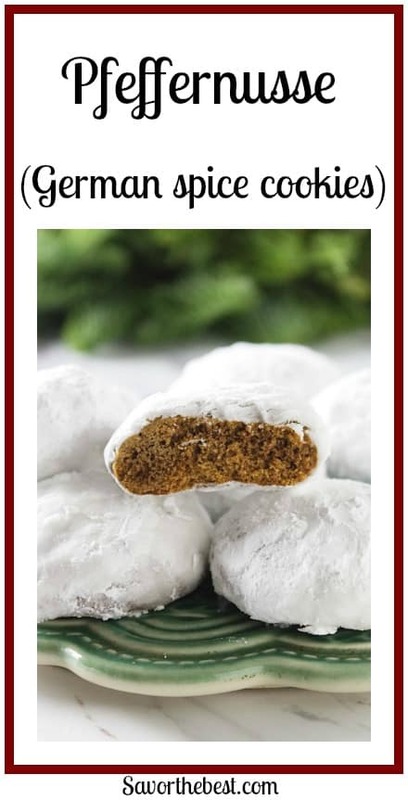 Have you made these Pfeffernusse (German spice cookies)? We would love to see a picture. Tag us on Instagram.